I did not knit in public yestetday, but I did go crazy at a fiber festival and bought tons of yarn and an alpaca fleece to boot. Does that count? I just love your pictutes… So inspiring. I need to take sock yarn and needles out on an adventure too!! I really enjoyed yesterday. I’m not a knitter but I have also been at almost all of you two’s WWKIP Days. In fact, I have taken many of the pics I’m proud to say. 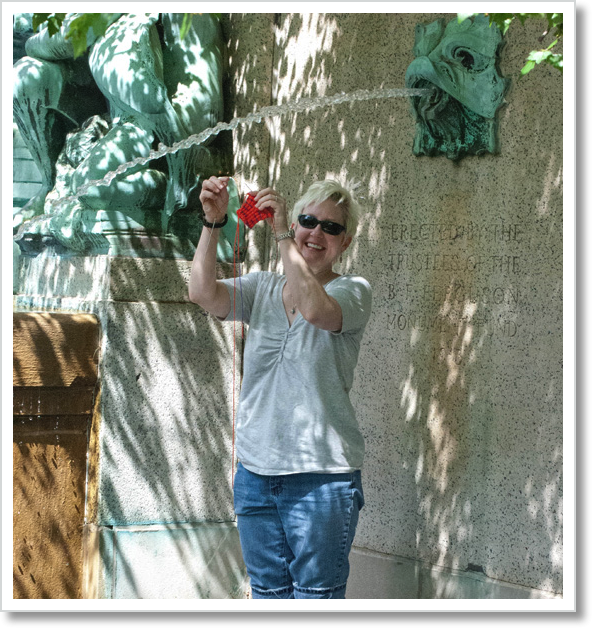 I also enjoyed the story about the knitting scavenger hunt. I didn’t knit in public (blame apt hunting and packing … ughh) yesterday but I knit on my bus and train rides daily … does that count? LOLOL! In the spirit of all things fiber, I started a new spinning project, worked on my current hat wip, started a new hat wip and bought two skeins of yarn after more than 2 years of not buying yarn for myself. You and Cari look like you both had a wonderful day, please get her to post more spinning pics on her blog … please and thank you! LOL! Nicky, I would LOVE to get more time on the blog, and the farm website. Life gets in the way. Thanks for wanting to see more of my spinning. that’s very motivating. Cari and I did have a good time on Saturday. It was the first time we’d seen each other in ages, so we revelled in every second. I agree about the spinning pics. I’ll work on her! Been mulling over this for a few days, because it always touches my heart when you write about our relationship, because it means so much to me. You’re the family I chose, the sister of my heart. You’re there for me each and every day even though we don’t get to see each other as often as we’d like. I’m motivated to do more, and be better at everything just by knowing you. It would have been so much fun to have enjoyed some Chicago fiber adventures together, indeed! 😉 It’s a great city for fiber-lovers, as I’m slowly discovering! And that idea would have made for an epic photo – short of boarding a plane, one doesn’t get much higher than the glass floor of the Sears! (I’d have to steel my nerves before hazarding that picture!!). What a fab idea! I can imagine that being so much fun in Glasgow, I must see if we do anything like that over here. Previous Post : In the good things department . . .